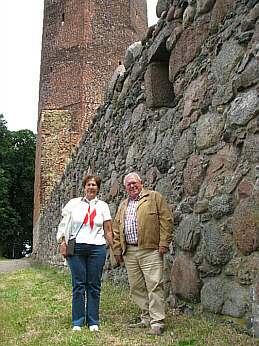 Opa and Oma were both born in Kreis Schlochau. They lived on a farm, about 60 hectres, just across the lake from Prechlau. They raised cows, chickens, pigs, geese, and sheep. They also kept horses and goats. The crops that they raised where potatoes, rye, sugar beets, wheat and oats. 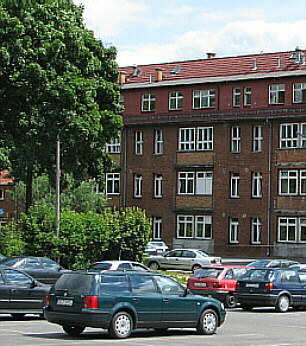 They had 7 children, all born in Prechlau. The oldest was born in 1932 and the youngest in 1944. Opa was a heavy machine operator for the army and also manned a look out tower to watch for enemy airplanes. 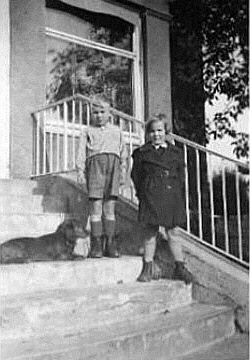 Sometime in late February 1945 Oma and the children where visiting her mother in Förstenau. While they were there they heard on the radio that the Russians had broken through German lines and were advancing their way. 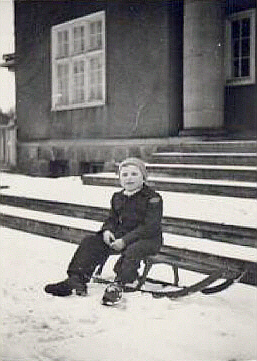 They hurried home on the sled and Opa began preparing the wagon for them to leave. He put up a roof and filled the wagon with straw, along with some necessities and personal belongings. He then sent Oma and the children off to the Baltic Sea where they would try to could catch a boat to the west. He stayed on in Prechlau waiting for his orders. Oma and a couple, traveling with them, (Probably one of Opa's brothers and his wife), drove mostly by night, because the planes would shoot at the wagons and people on the roads. They hid in abandoned houses by day. During this time a soldier looking for food or money stole a suitcase off the the wagon containing their personal papers. They pressed on and were able to get close enough to the Baltic Sea to hear the waves when the Russian over took them and sent them back to the farm. Later they were told that they were lucky to have not made it to the ships as most were bombed and many sank. 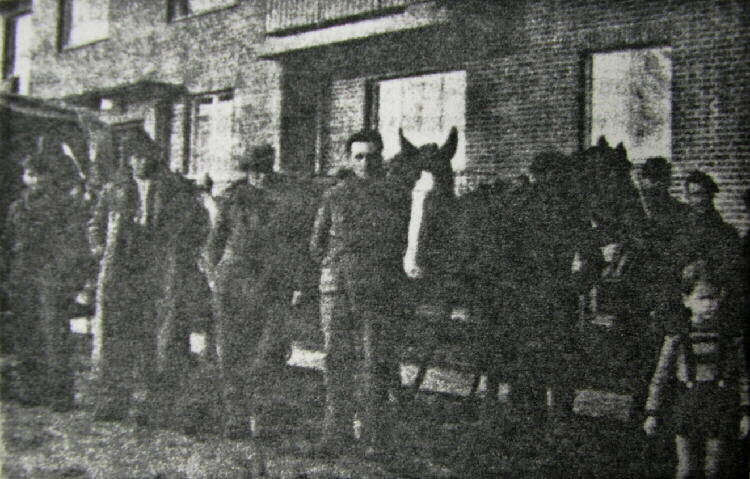 During this time Opa had left Prechlau and was captured and placed in an English prison camp. 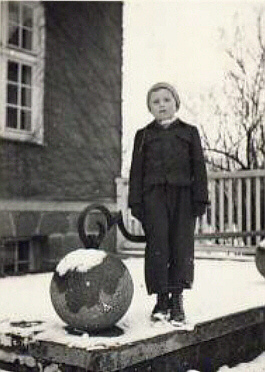 He was a prisoner for up to a year and a half and during that time Oma did not know were he was. Oma then returned to the farm and stayed there until the Russians gave the farm to Poland and the polish people. During that time, before they left the farm for a second time, Oma was raped by a Russian soldier in the presence of the children. She became pregnant and later would have a baby girl. 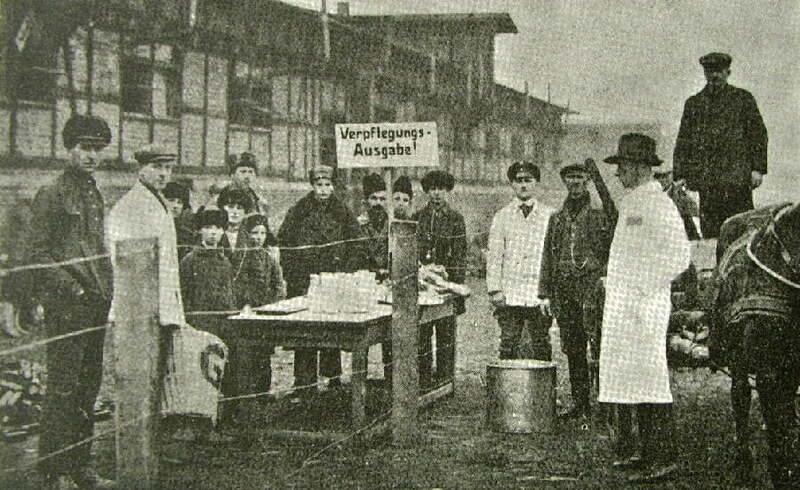 After the farm was taken from her, she and the children moved into the town of Prechlau for a period of 3 - 4 months. During this time she was able to sell a few possessions and buy train tickets for the family to the west. Sometime during all this Oma's mother was accused of supplying the Germans with guns and was taken to prison. She was then shot by a firing squad. Oma was able to get a train out of Prechlau. The people were put in cattle cars with little food, and water which came from the trains boilers. Many people became sick from the water. The cattle cars were packed so tight with people that all you could do was sit or stand. The soldiers would walk on the people to go through the car. Buckets were used as toilets. The train first took them to Stettin and after 4 or 5 days they got back on and went on to Berlin. They stayed in Berlin for about a week in a school house with other refugees who were also trying to go to the west. While they were in Berlin they had little or no food and Oma's 5 year old daughter ran off to find bread. She wandered around and found a bakery but they shooed her on. A lady found her and brought her to a children's home where they tried to make her take a bath. She ran off and back onto the street where another lady found her and asked her where she was going. She explained to her about the school house and so the lady brought her there, but everyone had already gone. Oma had waited till the very last train but could not wait any longer, so had left the school house. The lady then took her to the train station where she was able to find her Oma and reunite her. From Berlin the train took them to Wismar and then on to Krassow were Oma gave birth to the youngest in the family, a baby girl. From Krassow they were taken to a holding station called Durchgango-Lager. Everyone was made to shower and powdered for lice. Then they boarded the train again and were taken to Poeppendorf and on to Eckernfoerder. There they were taken off the trains and to busses waiting for them. There were also local people who had been told to take a family to house and feed in return for their work. Oma picked a wagon and the family was taken to Hoffnungstahl farm. 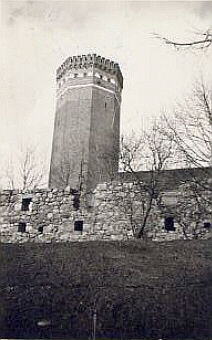 It was a large farm that was owned by a man named Emil Lange. 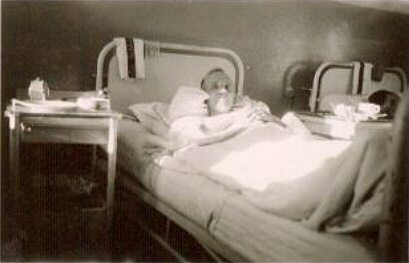 While they were there they became sick with Typhoid Fever and the whole family was taken in to the hospital. During that time Opa was searching for his family and because they were in the hospital the Red Cross was able to reunite them. They worked for Emil for 2 years, he paid them with eggs, milk, potatoes and a bit of money. They also received ration cards which they could exchange for food and clothing. After the two years Oma and Opa went on to Rendsburger-Lager (camp) where they lived for 10 years. accommodated in the city some days before? "Just don't think about it!" train. If only we could get away. given. One did not have the time to say  farewell to their friends. hopeless to take a train. 1. Ilse says she skated a little every day. 2. 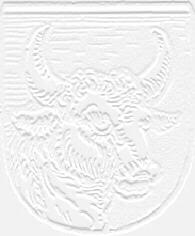 Ilse went to school in Preussich Friedland, 30 miles from Baldenburg. 3. Not many people had cars. All cars were confiscated for the war. The doctor sent the driver to pick up his own 3 children and Ilse. evening, we had only put 13 km back and reached the next village (Porst). There were often standstills, because the wagons drove so crowded. probably never had to pull so heavy a load. the wagon and it annoyed me that we were not progressing more quickly. to cry. My feet were sore, and I wanted to be sleeping on a bed. know if they should progress on the next day. Only the two exhausted boys slept soundly on the hard cold earth. and we progressed more quickly. a window and observed the street. Russian troops had been brought to a standstill. between Poznan and Baldenburg was right around 100 miles. 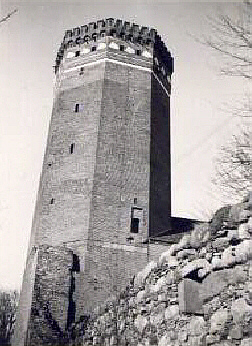 the city formed an important knot-point in the Eastern Front. week long, until the whole trek came back worried about my fate. as the city was suddenly shot at. population, we would probably not sleep so quietly. horses and crying children passed us; friends shut themselves to us. the late afternoon, the first Russian tanks in the streets. because Russians were in the house. caught operating this weapon would not be taken alive. live. We had to be really quiet, so as not to betray ourselves. night, the Russians shot the city in a blaze with tracer ammunition. didn't burn. Outdoors, a dreadful sight presented itself to us. air and danced around homeless people who were rushing through the streets. people, were allowed to go home already after a quarter of an hour. shot to pieces, from approaching tanks, pushed into the ditches. friend. Only if we saw Russians coming we sat in our hiding places. Poles and Russians. A Russian "soldier girl," had the supervision. that these girls suffered throughout their deportation in Germany. and she lived with many other people in a small house together. they were carried off, and where they were confined for two months. that grew in prodigal fullness in the abandoned gardens. 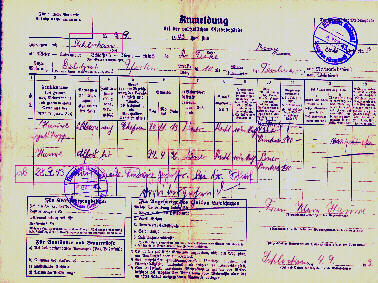 ticket" for Germany, and on the 30 November 1945 began our trip. house together, drove us to Neustettin, to the railway station. the remaining things from us on the way. The trip was dreadful. they both continued on foot (8), so as not also to be carried off. We were infinitely glad that again without fear we could live. 8. They had walked all the way across the Oder River. became with - 30 degrees cold begun. came towards us on the way. They stole also the last valuables. renovated building-complex completely burned out and declined lay there. big damages, that could be recompensed no longer, with all involved people. from the former German eastern area from the province of lower Silesia. expression over the successful new beginning. smith-son Erich Sonnenberg and lives in Mülheim/Ruhr, my great-aunt. 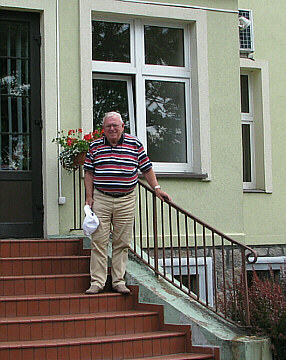 home in Wismar and has married Manfred Koch from Schlochau. Brandenburg north of Berlin today. half-timbered house, barn, shed, machine shed and apiary belonged to the farm. business ventures with her husband in West Germany. a Lanz-Bulldog-Tractor and horse team and got to the West. also in the direction of our farm buildings but did not hit any building. in Bischofthum, because dead soldiers lay on several farmyards. was no electricity; since December 1944 there was no school in session. children were cared for by Albert Giese. since the geese often strayed over to there. Russians in the direction of Berlin and slaughtered for their fighting troops. lying down in fresh stinging nettles. threw them away again because they didn’t know how to ride a bicycle. Our family and the neighbors were often overrun by the Russians. they were looking for weapons, munitions, radios, and clocks. place in the barn was dug up and the valuables were plundered. house during the raid with a rifle. to his brother Walter in the private cemetery at Hohenstein. Then in June 1946 there was the expulsion by the Polish authority. worthless Reichsmark. We had no Zloty and we also had no more animals. (about 25 km), which he also did. train we even had to sit in a third class compartment. well as our relative Wilhelm Kuchenbekker were driven out. but only for a short time; he then brought us something healthy to eat. Südtondern, into two rooms of a Wehrmacht barracks with bunk beds. Groceries could only be bought with Marks. worked as night watchman in a knitting factory and at the airport. order to get wood to burn for heating and cooking. ad, these bottles were sought by a firm for the production of combs. square meters for potatoes and vegetables. mother in the year 1951; she died of cancer. piece of land belonging to my parents. led my own firm from 1968 to 2000.
open secret that the Germans were retreating from all fronts. themselves for the flight without a husband and father. goodness, our family was all together. the tarp. Only the most important goods were stowed on the wagon. horses. Only a very few had tractors attached to their wagons. cages for small animals like chickens, geese, ducks, and rabbits. farm in a short time. At the departure time everyone was embracing. individual family members began, except for my small brother Peter. the coal. Mother absolutely wanted to take our feather beds along. what it meant to leave one’s home within just a few hours. war who had worked in the agricultural industry. disappointments and terrible exceptions as everywhere in life. only a few inhabitants of the village waiting there for a train. was and when it would arrive in Neuguth. hours in the icy cold at the train station and waited for a train. shell strikes of the Russian artillery." children, and old people. On the walls, there was shiny ice. All pieces of luggage were piled together in the middle of the car. train didn't stop long and set back into motion in the icy coldness. We rode in the direction of Prechlau and continued to the city of Schlochau. finally got something warm in the stomach. the rarest cases, the people would be reunited at the next station. the open stretches when the train had to make a forced stop there. hungry." Many a time, that brought me an extra portion of soup. babies could go up into the locomotive to warm up. the wall, and started a fire. car was the only one from the whole train which could be heated. powerfully, both psychologically and physically. the car to get some soup from the Red Cross and to stretch our legs. them had big syringes that looked like big air pumps in their hands. had to prepare for the flight with their families. train wouldn't be struck, that is, rolled over by the Soviet Army. greatly swollen from the milk they produced, that they had burst. people were then murdered by roaming foreign workers. cross the Oder River to get to the west. freight train, although at times we became a united community. children had to be fetched quickly. This went without a hitch. trust herself to do that because she was afraid of losing us. stockings, down onto her shoes, and onto the train platform. Although it stank like the plague, there was no stopping or waiting. We heaved Grandma with momentum and united strength into the car. 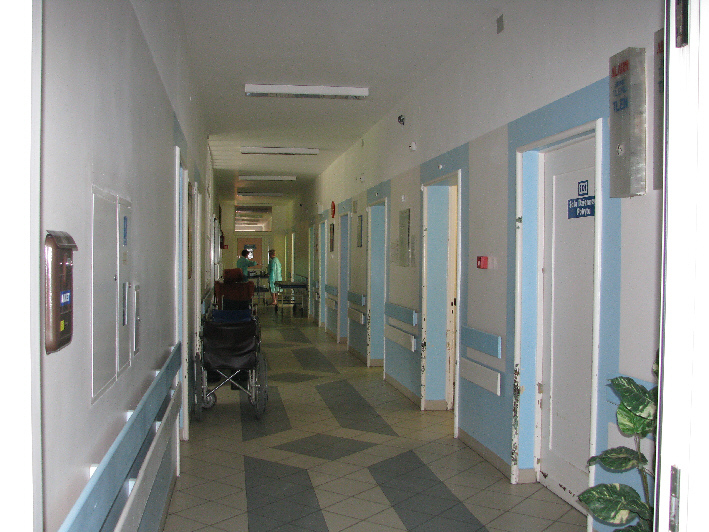 the hallways had to remain open for the nursing personnel. 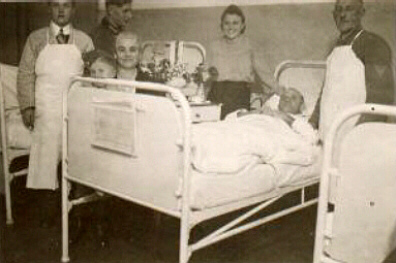 nurses needed the entire place for the care of the wounded. officer hearty thanks for being taken along in the hospital train. and our whole family got off. There we stood like a lost crowd. I could stretch out and sprawl. the Oder and escaped with their lives. And a Return After 63 Years! our home town and found a housing with friends in Delitzsch, Saxony. on Friedrich-Ludwig-Jahn-Strasse #3 in the house of the Lawyer Dr. Schleiff. Gelsenkirchen, we remained in Schlochau because it was quiet there. 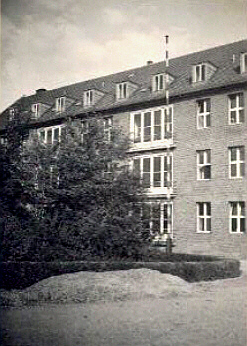 Friedrich-Ludwig-Jahn Strasse #3 in Spring 1944. 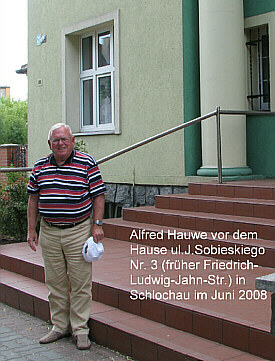 Alfred in the same spot 63 years later in 2008.
lived in. I had no idea whether the war had spared it. From Mr.
months daily, has survived the war. few grenades have left their tracks. in Lesno,Poland for advice and support. Schlochauer Heimat Stube in Northeim. Germans from Russia in the refugee camp at Hammerstein 1929-30. Photo from the Schlochauer Heimat Stube in Northeim.